Karcher K2 Plus 1600PSI 1.25 GPM Electric Pressure Washer uses the patented N-Cor pump. The Pump resists corrosion and provides you a very good water pressure. Most of the time people get confused between an electric pressure washer and gas pressure. Finally, they end up taking a wrong decision. An electric power washer is way better than a gas pressure washer if you want to use it only for the residential purpose. Karcher is a well-known brand that develops electric pressure washers and most of their products are pretty reliable. Karcher K2 is one of their best models to satisfies all the needs that a user asks for. Along with the pro-style spray gun, they provide two excellent spray wands. One of them is DirtBlaster and the other is Vario Power Spray (VPS) wand. With these spray wands, you can adjust the pressure right from the wand. The device provides 1600 PSI water pressure and it doesn’t need high voltage so that you can easily use your household outlets. The price of this device is also pretty low and you don’t have to think much about your budget. 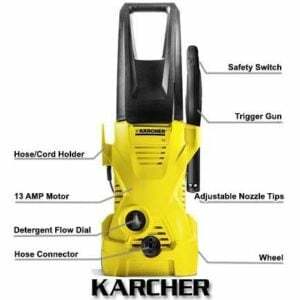 The motor that is used in Karcher K2 Plus 1600PSI 1.25 GPM Electric Pressure Washer delivers 1600 PSI of water pressure.The device uses Karcher N-Cor pump. The pump is completely corrosion free and delivers 1.25 GPM water flow for a smooth cleaning. To run the device it requires the standard 120-volt household outlets on 13 amp circuits. Two expert spray wands are given with the device; DirtBlaster spray wand that rotates the spray and makes the tough jobs do easily and the Vario Power Spray (VPS) wand easily adjusts the spray shape directly from the wand. The pro-style spray gun has a comfortable grip to reduce fatigue and do your job comfortably. It has the 20-foot high-pressure hose that lets you do your work in a wide area. The 35-foot power cord has a GFCI plug for your safety in a wet ground and the length of the power cord allows you to take the connection from inside your house while keeping the machine outside. The tall, fixed, durable handle allows you to carry the device easily without bending. The machine is not heavy, it has a weight of 16 pounds only that allows easy to carry around. The dimension of the device is 9.0 inches depth, 30.8 inches height, and 11.0 inches width. The device has onboard storage for its instruments. 1600 PSI Water Pressure: When you do your household cleaning 1600 PSI water pressure is quite enough to do most of the tough cleaning jobs comfortably. With this water pressure, Karcher K2 Plus 1600PSI 1.25 GPM Electric Pressure Washer helps you cleaning your car, motorcycle, RV, driveway, fence, walls and much more. Expert Spray Wand: The two expert spray wands helps you do most of the tough works complete easily. With most of the pressure washers, you don’t get these expert spray wands and you have to pay extra money if you want them. But here, they come with the device for free. Karcher N-Cor Pump: The Axial type pump is totally corrosion free and provides 1.25 GPM water flow. And anti-corrosive pump always lasts longer than the other pumps so that you can use it for years. The design of the device makes it easier to carry from one place to another and it occupies less space in your garage. Warranty: To protect your valuable investment the Company gives you 2 years of warranty for any kind of manufacturing defect. They will either exchange or fix your problem for free within two years from your purchase. Some users find that the lance hose is a little short which requires the washer to carry around the car. Most of the users don’t find it a problem. Some people say that the water pressure is not high enough to do some heavy duty cleaning. Not all the products are perfect as they cannot satisfy all the human requirements. Karcher K2 Plus 1600PSI 1.25 GPM Electric Pressure Washer fulfills most of the requirements and it establishes itself as one of the best electric pressure washers available in the market. It will be much more beneficial than the amount you will pay to purchase this device. This machine will help you and will always be with you like a true friend. 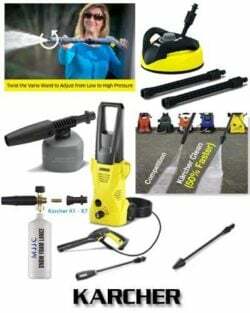 If you want to buy a pressure washer for your residential use this device can be your best option. Click to Buy with Latest Price & Free Shipment on Amazon, Now!